5.2 Million engagements on Facebook in just a few days according to CBS News. On Instagram currently ie tonight at 12.15am, there are 2.3 Million posts alone using the hashtag ‘10yearchallenge’ not forgetting the similar hashtag ‘10yearschallenge’ (with an ‘s’) has racked up 1.7 Million posts. So a total of 4 Million posts to date on Insta. On Twitter in the past hour there have been 6010 tweets on the hashtag. Mariah Carey has even commented!. Facebook have spoken. In a statement on Fox News they say ‘This is a user-generated meme that went viral on its own. Facebook did not start this trend and the meme uses photos that already exist on Facebook. Facebook gains nothing from this meme (besides reminding us of the questionable fashion trends of 2009)’. They add ‘As a reminder, Facebook users can choose to turn facebook recognition on or off at any time’. Regardless of who started it, what are the chances this data won’t be used by some organisation for analysis? Without your permission. Why should people think before joining in the 10 Year Photo Challenge? ‘Think before you post and share images on social media platforms’. Now you are probably thinking, right about now – Wayne surely a lot of those images are already on Facebook? In some cases I would suspect so, but there were no smartphones 10 years ago. 10 years ago lot of images would of been uploaded via crappy old digital cameras, SD card or scanned on via some sort of printer scanner. The earlier images uploaded would not have been as data rich as those we upload today via our Smartphones. Therefore todays images provide loads more data such as date captured, location, time etc – all of which could be analysed for various purposes including new AI technology. 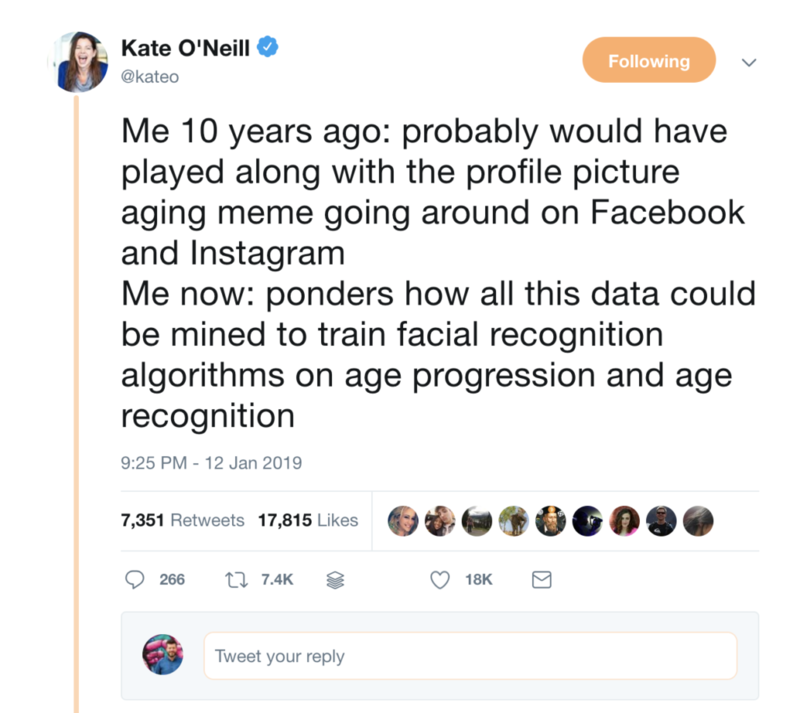 For facial recognition to work and be successful it would probably need to be able to recognise someone as they get older – and obviously pick up if something isn’t right – for example someone lifting an image of a user in 2007 and trying to authenticate it in 2019. Of course better security and authentic processes are ever more important as technology develops. And with this Challenge it’s important to remember my earlier message – that of thinking critically before you post or share images online. Question who could have access to them and how could they be used. 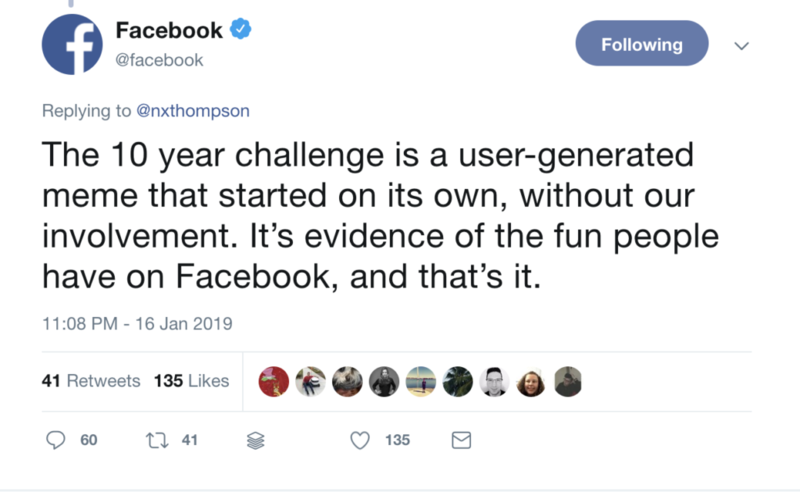 Thanks to this meme challenge doing the rounds at the moment, it’s created a very large data set of curated photos of people which is still growing daily (in the past 15 minutes on my own Facebook I’ve seen 6 friends join the challenge). So just take a minute. Think about how you’d like your personal information (aka itsjustdata to some organisations) to be used, how it could be used when things go wrong and how all of this data can be analysed, without your permission, to manipulate you personally or on a great scale. The American Civil Liberties Union asked Amazon to quit selling on facial recognition data for a reason according to Kate O’Neill in her book TechHumanist. Stay alert and aware about your civil liberties when using social media and how we all have a part to play in shaping the internet for the better. The right to privacy for our information should be respected. By organisations and by ourselves.